Swapping polymer clay items with other people is always a lot of fun. In many cases, you never know what you’re going to get, but making a small gift to send … well … that’s my favorite part of any Polymer Clay Swap. This swap and FB group is run by me. You can read our group SWAP rules here. 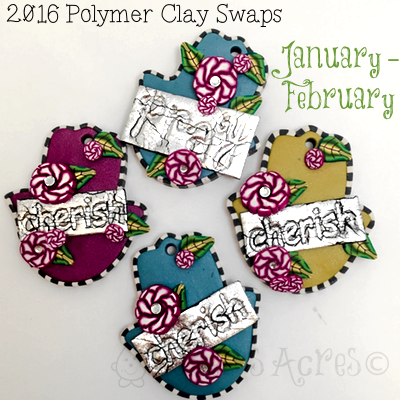 Polymer Clay Adventure (PCA) – Monthly Themed Swaps with 3 gifts to be made & sent per swap. You can see a reoccurring theme here by now. Most swap groups swap via creating their items around a theme for a specific month. The themes are chosen by the organizers of the swap. This list of swap groups is NOT inclusive. There are MANY other groups you can swap with. On a personal note as a swap administrator, if you have committed to a swap, it is your responsibility to follow through. If you received something, it is also your obligation to send something in return. Please do NOT sign up for a swap if you know you can’t fulfill making and shipping your item. This leaves people sad, hurt, frustrated, and also gives you and your business a bad reputation. Not to mention that in many cases you will be thrown off teams, groups, or have memberships revoked. This behavior is not acceptable. In many cases a simple email to the swap administrator can take you off the list, even temporarily if you find you can not fulfill your end of the bargain. I have sent a variety of items to different swappers this year. It’s so hard to keep track of who sends what for which swap (because I do so many) that I get SO easily confused. In some cases I have never received anything back. Regardless, you can see the swap items I sent to my various swappers at the left. HOP! Purse Dangles Swap – Two polymer clay bead & ribbon dangles. I really enjoy making things and swapping with other artists. I find it incredibly enjoyable and a whole lot of fun. To those of you who have swapped with me and fulfilled your end of the swap, I am very grateful. THANK YOU! I can’t wait to do this more often in the future. My first swap with the butterflies, my question is how many items do you make and send. I have one done, but I am wondering about more. You only have to make one for our group Laurie. But many people will make a couple to send to their partner. Especially if they are small. That is awesome! Thank you for sharing, I have learned so many neat things from you. It is very hurtful and frustrating when your swap partner doesn’t fill their end of the swap. You’re very welcome Donna. I’m glad you are learning! It is frustrating. We have things in place in the PC Tribe to TRY and keep that from happening, but it doesn’t mean that it doesn’t happen. But for the most part (with the exception of extenuating circumstances) you don’t send once, you’re out of my swap group. People work TOO HARD to make / ship their items to receive no gift of love in return.